Dear Pinterest, I find you truly inspirational. You've helped me to organise my bedroom, cook up some tasty meals and you've even helped me plan my (yet to happen, I'm not even engaged) wedding! I love spending time with you Pinterest. You're my BFF. 1. Camel coat + black jeans + boots + chunky jumper = the ultimate autumn outfit. And having recently ransacked my wardrobe and offered the majority of it's contents to the local charity shop, I've been on the hunt for a few staple autumn pieces. I picked up a very similar camel coat at Northfield Market (bargain) and will be strutting my stuff in my Topshop dupe boots. However, if you have any chunky jumper recommendations they would be greatly appreciated. 3. I love Pineapples. 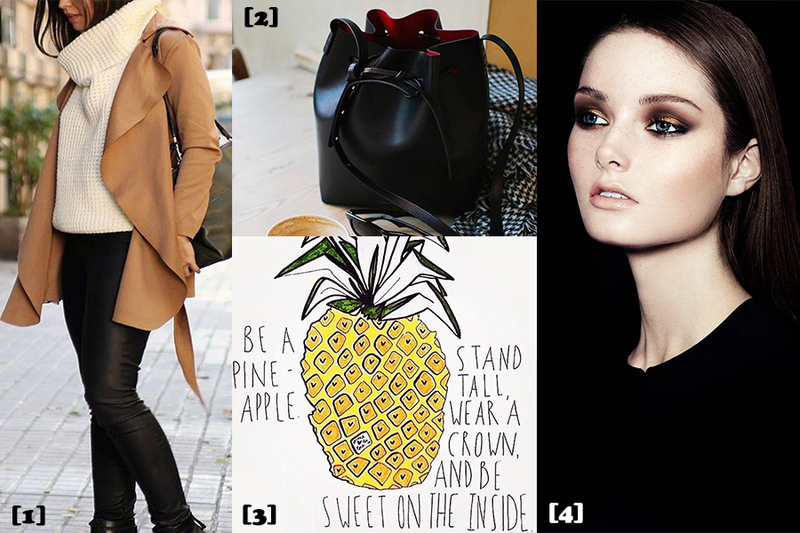 In fact, I have a whole board dedicated to Pineapples. So this quote resonates with me greatly. That is all. You can find me hanging out with Pinterest here.